Tiaina Baul Seau Jr. (/ˈseɪ.aʊ/; SAY-ow; January 19, 1969 – May 2, 2012), better known as Junior Seau, was a linebacker in the National Football League (NFL). Known for his passionate play, he was a 10-time All-Pro, 12-time Pro Bowl selection, and named to the NFL 1990s All-Decade Team. He was elected posthumously to the Pro Football Hall of Fame in 2015. Seau was born January 19, 1969, in Oceanside, California, the fifth child of Tiaina Seau Sr. and Luisa Mauga Seau of Aunu'u, American Samoa. Tiaina Sr.'s grandfather was a village chief in Pago Pago. Tiaina Sr. worked at a rubber factory and was a school custodian, and Luisa worked at the commissary of Camp Pendleton in Southern California and a laundromat. After Seau was born, the family moved back to American Samoa for several years before returning to San Diego; Seau did not learn to speak English until he was seven years old. At home, Seau and his three brothers had to sleep in the family's one-car garage. Seau attended Oceanside High School in Oceanside, where he lettered in football, basketball, and track and field. As a football player, Seau was a starter at linebacker and tight end, and as a senior, he was named the Avocado League offensive MVP and led the 18-member Oceanside Pirates team to the San Diego 2A championship. Parade selected Seau to its high school All-American team. In basketball, as a senior, he was named the California Interscholastic Federation San Diego Section Player of the Year. He helped his team win the 1987 Lt. James Mitchell Tournament and make third place in the Mt. Carmel Invitational. In track and field, he was the Avocado League champion in the shot put. Seau was also named to California's all-academic team with a 3.6 grade-point average. After graduating from high school, Seau attended the University of Southern California (USC). He had to sit out his freshman season due to his 690 SAT score on the college entrance exam, which was 10 points short of USC's minimum score for freshman eligibility. Seau told Sports Illustrated: "I was labeled a dumb jock. I went from being a four-sport star to an ordinary student at USC. I found out who my true friends were. Nobody stuck up for me—not our relatives, best friends or neighbors. There's a lot of jealousy among Samoans, not wanting others to get ahead in life, and my parents got an earful at church: 'We told you he was never going to make it.'" This prompted him to apologize to his coaches, teachers, and principal at Oceanside High. He lettered in his final two seasons, 1988 and 1989, posting 19 sacks in 1989 en route to a unanimous first-team All-American selection. After three years as a Trojan, Seau entered the NFL draft after his junior season and was chosen in the first round of the 1990 NFL Draft by Bobby Beathard's San Diego Chargers as the fifth overall draft selection. Seau quickly became one of the most popular players on the Chargers, receiving the nickname "Tasmanian Devil", after the wild antics of the cartoon character. He became the face of the Chargers franchise and a San Diego sports icon. Seau started 15 of the 16 games he played in during his rookie season, and was named an alternate to the 1991 Pro Bowl after recording 85 tackles. In 1991, he picked up 129 tackles and seven sacks and was named to the 1992 Pro Bowl, the first of 12 consecutive Pro Bowls for Seau. He was also voted NFL's Defensive MVP by the Newspaper Enterprise Association AFC Defensive Player of the Year by United Press International, as well as the NFL Alumni Linebacker of the Year and the NFLPA AFC Linebacker of the Year. He started no fewer than 13 games for the Chargers over each of the ensuing 11 seasons, registering a career high with 155 tackles in 1994. That year, Seau was named NFL Defensive Player of the Year by United Press International, and he led his team to a championship appearance in Super Bowl XXIX. In one of the greatest games in his career, he recorded 16 tackles in the 1994 AFC Championship Game while playing with a pinched nerve in his neck in a 17–13 victory over the Pittsburgh Steelers. In 2002, his final year with the Chargers, he logged a then-career low 83 tackles and missed his final Pro Bowl with an ankle injury. On April 16, 2003, Seau was traded to the Miami Dolphins for a conditional draft choice. He started 15 games that season for the 9–7 Dolphins and was one of their standout defensive players. However, in 2004, a torn pectoral muscle limited Seau to eight games, 68 tackles, and one sack. He started five of the first seven games he played in with the Dolphins in 2005, but was placed on injured reserve on November 24 with an achilles tendon injury. On March 6, 2006, Seau was released by the Dolphins. Seau announced his retirement at an emotional press conference on August 14, 2006. He called it his "graduation", because he was not going to stop working. He contended that he was merely moving on to the next phase of his life. Seau returned to football just four days later, signing with the New England Patriots. He started 10 of the first 11 games for the Patriots, recording 69 tackles before breaking his right arm while making a tackle in a game against the Chicago Bears. He was placed on injured reserve on November 27. On May 21, 2007, Seau re-signed with the New England Patriots for the 2007 season. In September 2007 Seau was named one of the Patriots' seven captains. He was a prominent contributor to the Patriots undefeated regular season that year. He started four of the 16 games he played in for the Patriots in 2007, and then started the Patriots' two playoff games before Super Bowl XLII against the New York Giants. New England's undefeated streak ended with a Super Bowl loss to the Giants. After the Patriots had a number of injuries late in the 2008 season, they re-signed Seau. He started two of four games he played. On December 22, 2008, a fan was arrested for trespassing and assault and battery for tackling Seau as he stood on the New England sideline during a home game against the Arizona Cardinals. Seau stated that he did not feel threatened by the fan; he thought that the fan was happy and excited and got carried away. On October 7, 2009, NFL Network reported that the New England Patriots had an "agreement in principle" with Seau for a fourth one-year deal; Seau took physicals and worked out with the team. He officially signed on October 13. He was active for 7 games for the Patriots in 2009, recording 14 tackles as a reserve linebacker. Seau announced his intention to retire permanently on the television program Inside the NFL on January 13, 2010. Key: Solo = Unassisted tackles; Asst = Assisted Tackles; INT = Interception; Yds = Interception return yards; Long = Longest Int Return; Avg =Yards per Int Return; TD = Int Returned for TD; FF = Forced Fumbles; FR = Fumble Recovery; yds = Fumble return yards PD = Pass defensed. His restaurant in Mission Valley, California—Seau's The Restaurant, which opened in 1996—was his most successful business venture. Seau also had a clothing line, Say Ow Gear. The restaurant was closed May 16, 2012, just two weeks after his death; the trustees of his estate explained that "Without Seau's charismatic leadership, it was felt that the future profitability of the restaurant could be in question." Sports Jobs with Junior Seau premiered on December 2, 2009, on Versus. The show followed Seau as he did the jobs that make sports work. Ten episodes aired through January 27, 2010. Seau was actively involved with community work through Samoan "sister city" projects within San Diego County. In 1992, Seau created the Junior Seau Foundation with the mission to educate and empower young people through the support of child abuse prevention, drug and alcohol awareness, recreational opportunities, anti-juvenile delinquency efforts and complementary educational programs. The 20th Anniversary Junior Seau Celebrity Golf Classic was held March 10–12, 2012, at the La Costa Resort and Spa. The Foundation gives out an annual award to the individual who exemplifies the mission statement of the Junior Seau Foundation. In 1989, Seau's oldest son, Tyler, was born to Seau's high school sweetheart, Melissa Waldrop. Seau broke up with Waldrop when Tyler was 13 months old. He married Gina Deboer in 1991. The couple had three children together, a daughter and two sons, before divorcing in 2002. Seau sustained minor injuries in October 2010 when his SUV plunged down a 100-foot cliff hours after he had been arrested for domestic violence following an incident reported to the police by his girlfriend. Seau maintained he had fallen asleep at the wheel, and was never charged in the domestic incident. Seau's nephew, Ian Seau, committed to play at Nevada, and became an undrafted free-agent for Los Angeles Rams in 2016 as a defensive end. Then in 2017, Ian signed with the Bills. Another nephew, Micah Seau, committed to play for San Diego State. His cousin was Pulu Poumele. On May 2, 2012, Seau's girlfriend found him dead with a gunshot wound to the chest at his home in Oceanside. He left no suicide note, but he did leave a paper in the kitchen of his home with lyrics he scribbled from his favorite country song, "Who I Ain't". The song, co-written by his friend Jamie Paulin, describes a man who regrets the person he has become. Seau's death recalled the 2011 suicide of former NFL player Dave Duerson, who shot himself in the chest and left a suicide note requesting that his brain be studied for brain trauma. Seau had no prior reported history of concussions, but his ex-wife said he did sustain concussions during his career. "He always bounced back and kept on playing," Gina Seau said. "He's a warrior. That didn't stop him." Seau had insomnia for at least the last seven years of his life, and he was taking zolpidem (Ambien), a prescription drug commonly prescribed for sleep disorders. Seau's autopsy report released later in August 2012 by the San Diego County medical examiner indicated that his body contained no illegal drugs or alcohol, but did show traces of zolpidem. No apparent signs of brain damage were found, nor was he determined to have exhibited mood changes and irritability often apparent with concussions and brain damage. There was speculation that Seau suffered brain damage due to CTE, a condition traced to concussion-related brain damage with depression as a symptom, as dozens of deceased former NFL players were found to have suffered from CTE. Seau's family donated his brain tissue to the National Institute of Neurological Disorders and Stroke, part of the NIH; other candidates included the Center for the Study of Traumatic Encephalopathy and the Brain Injury Research Institute. Citing the Seau family's right to privacy, NIH did not intend to release the findings. On January 23, 2013, the Seau family sued the NFL over the brain injuries suffered by Seau over his career. In 2014, his family continued to pursue the lawsuit while opting out of the NFL concussion lawsuit's proposed settlement, which was initially funded with $765 million. Seau was known for his passionate playing style, including a fist-pumping dance he performed after big plays. Rick Gosselin of The Dallas Morning News said Seau "probably was the most dynamic player of his era". NFL head coach Norv Turner, who coached Seau as well as faced him as an opponent, said, "The No. 1 thing about Junior was that he was such an explosive player he'd defeat one-on-one blocks and he was a great tackler." Seau's quickness allowed him to freelance, which sometimes put him out of position. "People say he gambled a bit, but in reality, his insight led him to the ball ... Even when he was wrong, you had to account for him and that created problems for offensive coordinators. You'd better have somebody blocking him," said former NFL coach Tom Bass. He was praised by teammates for his work ethic and leadership. He would play when hurt, and often refused to leave games. "He played the game the way it was meant to be played," said retired Denver Broncos quarterback John Elway. Bill Belichick, his coach at New England, praised Seau's leadership and willingness to accept any role. He was named to the Chargers 40th and 50th anniversary teams, which honor the top players and coaches in the team's history. He was inducted into the San Diego Chargers Hall of Fame on November 27, 2011, as part of Alumni Day ceremonies at a sold-out game against the Denver Broncos at Qualcomm Stadium. Fellow Chargers Hall of Famer Dan Fouts introduced Seau before a crowd of nearly 71,000. Chargers President Dean Spanos honored Seau after his death as "...An icon in our community. He transcended the game. He wasn't just a football player, he was so much more." The Chargers retired his No. 55 during his public memorial. 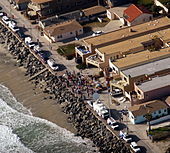 The Junior Seau Pier Amphitheatre and Junior Seau Beach Community Center were renamed posthumously in his honor by the city of Oceanside in July 2012. On September 1, 2012, during the University of Southern California's home opener, Seau was honored by the team. On September 16, 2012, the Chargers retired Seau's number 55 during a ceremony at the 2012 regular season home opener against the Tennessee Titans. The San Diego Hall of Champions inducted Seau into the Breitbard Hall of Fame on February 25, 2013, forgoing their normal two-year waiting period after an athlete's retirement or death. Seau became eligible for election into the Pro Football Hall of Fame in 2015; his eligibility was not accelerated due to his death from the standard five-year waiting period after a player's retirement. On January 31, 2015, Seau was elected to the Pro Football Hall of Fame. He had wanted his daughter, Sydney, to introduce him if he were ever to be inducted. However, the Hall of Fame cited a five-year policy of not allowing speeches for deceased inductees, denying Sydney the opportunity to introduce her father. Instead, she was allowed to speak onstage for three minutes uninterrupted on the NFL Network, and delivered a pared down version of her full speech, which The New York Times published. Seau is the first player of Polynesian and Samoan descent to be inducted into the Hall of Fame. On September 21, 2018, ESPN released Seau, a 30 for 30 documentary that highlighted Seau's career, as well as the effects of his injuries on his life, his family, and his post-football endeavors. ^ a b c d Williamson, Bill (May 2, 2012). "Junior Seau was San Diego". ESPN.com. Archived from the original on May 3, 2012. ^ a b c d Acee, Kevin (May 2, 2012). "Seau's feats on and off field spoke for themselves". U-T San Diego. Archived from the original on May 3, 2012. ^ "Aaron Hernandez Found to Have Severe Case of CTE". Frontline, US Public Broadcasting. Retrieved September 21, 2017. ^ "Aaron Hernandez Found To Have Had "Severe" Case of CTE". Frontline, US Public Broadcasting Station. Retrieved September 21, 2017. ^ a b "Junior Seau". USC Legends. Archived from the original on May 6, 2012. Retrieved May 2, 2012. ^ a b c d e "Junior Seau". New England Patriots. Archived from the original on December 18, 2009. Retrieved January 17, 2010. ^ Miller, Jeffrey (January 7, 1987). "Junior Seau Helps Turn Team Around". Los Angeles Times. Retrieved January 17, 2011. ^ "A Celebration of Life for Junior Seau" (PDF). chargers.com. San Diego Chargers. May 11, 2012. Archived from the original (PDF) on August 1, 2012. ^ Judge, Clark (September 18, 1992). "Junior's Achievement". San Diego Union-Tribune. To teammates, he is "The Tasmanian Devil," named after the frenzied cartoon character. ^ Carroll, Bob; Gershman, Michael; Neft, David; Thorn, John (1999). Total Football: The Official Encyclopedia of the National Football League. HarperCollins Publishers. p. 389. ISBN 0-06-270174-6. ^ "2014 San Diego Chargers Media Guide" (PDF). San Diego Chargers. 2014. p. 245. Archived (PDF) from the original on January 31, 2015. ^ a b "Police: Junior Seau found dead at home". SI.com. Associated Press. May 2, 2012. Archived from the original on May 3, 2012. ^ a b Walker, James (May 2, 2012). "Seau made impact in Miami, New England". ESPN.com. Archived from the original on May 3, 2012. ^ "Hall of a career? Junior Seau retires after 13 seasons". ESPN.com. Associated Press. August 15, 2006. Retrieved November 11, 2009. ^ Wilson, Bernie (August 18, 2006). "Seau signs with New England". Associated Press. Retrieved May 2, 2012. ^ Golen, Jimmy (January 22, 2008). "Seau going back to Super Bowl after 13 years". Associated Press. Retrieved May 2, 2012. ^ a b Reiss, Mike (May 2, 2012). "Reflecting on Seau's time with Pats". ESPNBoston.com. Archived from the original on May 5, 2012. ^ Perloff, Andrew (December 24, 2008). "Seau Comments on Fan Tackle, His Future". Sports Illustrated. Retrieved November 11, 2009. ^ Davis, Nate (October 8, 2009). "Patriots have 'agreement in principle' with LB Junior Seau". USA Today. Retrieved November 11, 2009. ^ Rapoport, Ian (October 13, 2009). "Linebacker Junior Seau officially signs with the Patriots, Versus announces". Boston Herald. Retrieved November 11, 2009. ^ Reiss, Mike (January 13, 2010). "Junior Seau plans to retire". ESPNBoston.com. Retrieved January 13, 2010. ^ "Junior Seau Stats". ESPN Internet Ventures. Retrieved March 24, 2014. ^ 2002 San Diego Chargers Media Guide. Pg. 128. ^ 2008 New England Patriots Media Guide. Pg. 247. ^ a b Baker, Debbie; Davis, Kristina; Repard, Pauline (May 2, 2012). "Junior Seau, hometown icon, takes his life". U-T San Diego. Archived from the original on May 3, 2012. ^ a b Davis, Kristina; Wilkens, John (May 2, 2012). "San Diego mourns loss of an icon". U-T San Diego. Archived from the original on May 3, 2012. ^ "Junior Seau's restaurant, popular with sports fans, closes". Los Angeles Times. May 16, 2012. Retrieved May 23, 2012. ^ a b Lieber Steeg, Jill (October 14, 2012). "Junior Seau: Song of sorrow". U-T San Diego. Archived from the original on October 24, 2012. ^ "40 Tyler Seau". gostatesmen.com. Retrieved January 9, 2013. ^ Lieber Steeg, Jill (October 21, 2012). "Junior Seau: Bitter endgame". U-T San Diego. Retrieved January 9, 2013. ^ Trotter, Jim (October 27, 2003). "Seau says his career has been rejuvenated with trade to Miami, but he'd rather be here". San Diego Union-Tribune. Retrieved January 17, 2011. ^ "Junior Seau: Biography". TV Guide. Retrieved January 17, 2011. ^ "Ian Seau". Yahoo! Sports. ^ Loh, Stefanie (August 29, 2014). "Aztecs' Micah Seau excited for 1st start". San Diego Union-Tribune. ^ John Maffei (June 4, 2016). "Football veteran Pulu Poumele dies". San Diego Union-Tribune. Retrieved June 11, 2016. ^ Lendon, Brad (August 21, 2012). "Autopsy: No apparent damage to Seau's brain". CNN. 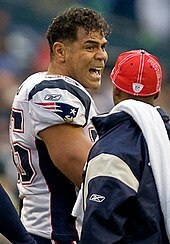 ^ a b Smith, Michael David, "Boston researchers request Junior Seau’s brain". NBCSports Pro Football Talk, May 3, 2012. Retrieved May 3, 2012. ^ Lopresti, Mike (May 2, 2012). "Is Junior Seau death part of a bigger problem?". USA Today. Archived from the original on June 1, 2012. ^ "Ex-Patriots LB Ted Johnson speaks". ESPN.com. Associated Press. May 18, 2012. Archived from the original on June 1, 2012. 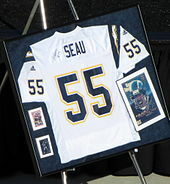 ^ "Junior Seau death raises questions". ESPN.com. May 3, 2012. Archived from the original on May 4, 2012. ^ "Junior Seau's death ruled a suicide". ESPN.com. Associated Press. May 3, 2012. Archived from the original on May 4, 2012. ^ Wilson, Bernie; Flaccus, Gillian (May 3, 2012). "Junior Seau latest in a series of NFL veterans' deaths". The Seattle Times. Associated Press. Archived from the original on May 4, 2012. ^ Moore, David Leon; Brady, Erik (May 31, 2012). "Junior Seau's final days plagued by sleepless nights". USA Today. Archived from the original on June 1, 2012. ^ a b Mihocoes, Gary (August 20, 2012). "Seau autopsy finds sleep-aid, no drugs of abuse". USA Today. ^ Lieber Steeg, Julie (August 21, 2012). "Seau autoposy: No illicit drugs or brain damage". U-T San Diego. Archived from the original on August 23, 2012. ^ Perry, Terry (August 21, 2012). "National Institutes of Health to study Junior Seau brain tissue". Los Angeles Times. ^ "Junior Seau's autopsy shows no illegal drugs, alcohol". NFL.com (The Associated Press). August 20, 2012. ^ "Seau family revisiting brain decision". ESPN.com. May 6, 2012. Archived from the original on May 6, 2012. ^ Alan Duke; Chelsea J. Carter. "Doctors to examine Junior Seau's brain". CNN. Retrieved May 4, 2012. ^ a b Given, Karen (May 12, 2012). "Researchers Compete For Athletes' Brains". wbur.org. Archived from the original on May 25, 2012. ^ Farmer, Sam (May 3, 2012). "Family of Junior Seau will allow his brain to be studied". Los Angeles Times. Archived from the original on May 4, 2012. ^ a b Fainaru-Wada, Mark; Avila, Jim; Fainaru, Steve (January 10, 2013). "Doctors: Junior Seau's brain had CTE". ESPN.com. Retrieved January 10, 2013. ^ a b Lavelle, Janet (July 12, 2012). "Seau brain tissue donated for research". U-T San Diego. Archived from the original on July 12, 2012. ^ "Family Makes Decision Regarding Seau's Brain". 10News.com. February 10, 2012. Archived from the original on May 25, 2012. ^ Pilon, Mary (July 12, 2012). "Seau Brain Tissue Is Donated to National Institute for Study". New York Times. Archived from the original on August 24, 2012. ^ Avila, Jim (January 10, 2013). "Junior Seau Diagnosed With Disease Caused by Hits to Head: Exclusive". abcnews.com. Retrieved January 10, 2013. ^ Busbee, Jay (September 3, 2014). "Junior Seau's family opts out of NFL concussion settlement". yahoo.com. Retrieved September 8, 2014. ^ a b c Canepa, Nick (May 3, 2012). "Celebrate Seau as a player". U-T San Diego. Archived from the original on May 5, 2012. ^ 10News (ABC-TV affiliate in San Diego, California) (November 27, 2011). "Junior Seau Inducted Into Chargers Hall Of Fame". 10News.com. Retrieved November 29, 2011. ^ "Junior Seau's No. 55 officially retired by San Diego Chargers". NFL.com. ^ Huard, Ray. "Council names beach amphitheater, rec center for Seau". Archived from the original on May 19, 2012. ^ Horn, Jonathan. "Oceanside beachfront landmarks named for Seau". 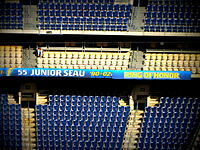 ^ "Hall of Champions to induct Seau on Feb. 25". U-T San Diego. Associated Press. September 17, 2012. Retrieved September 25, 2012. The board of directors at the San Diego Hall of Champions has decided to forego the normal voting process and induct Junior Seau into the Breitbard Hall of Fame on Feb. 25. ^ Rosenthal, Gregg (May 2, 2012). "Junior Seau will be eligible for Hall of Fame in 2015". NFL.com. Archived from the original on June 15, 2012. ^ Belson, Ken (July 24, 2015). "Junior Seau's Family Will Not Be Allowed to Speak at His Hall of Fame Induction". The New York Times. Archived from the original on July 25, 2015. ^ a b Sandomir, Larry (August 9, 2015). "After Sydney Seau, Football Hall of Fame Policy Will Be Tested Again". The New York Times. Retrieved August 10, 2015. ^ a b c Seau, Sydney (August 8, 2015). "The Hall of Fame Speech Junior Seau's Daughter Couldn't Give". The New York Times. Retrieved August 10, 2015. Wikimedia Commons has media related to Junior Seau. This page was last edited on 21 April 2019, at 18:10 (UTC).